Pyrite blocks in Donegal- October 2013. The following news article and radio interviews date from 7th November 2013. In “Donegal Homes Crumbling” Emma Cawley reported in pyrite in blockwork in a number of Donegal homes. Contrary to recent statements it appears pyrite on blockwork has been known for some time. According to the following article these cases first came to light on 17th October 2013. Some members of the construction industry have been quite critical of the handling of this problem, fearing that defective blockwork should have been withdrawn from the market as soon as a problem was identified, and an alert issued immediately. Many fear the blockwork in question may have been used up to quite recently on projects. The industry alert regarding on possible pyrite in blockwork was issued on May 29th 2014 by representative bodies for engineers and architects (ACEI & RIAI). Everyone’s aware of pyrite and the misery and stress it’s caused, now Donegal could be facing a similar problem. At this stage – everyone’s aware of pyrite and the misery and stress it’s caused for people. Now there are fears that hundreds of Donegal homeowners could be facing a similar crisis. Damien McKay is a chartered engineer based in Letterkenny, Co. Donegal. He did an interview on Highland Radio on the 17th of October on the issue of pyrite. Very quickly, the station was swamped with callers- all describing similar structural problems in their homes. In the two days after the interview Damien was called out to inspect 200 affected buildings. In most cases, structural problems become apparent four or five years after construction. At first, fine webbed cracks appear in the plaster of outer walls. These usually appear on gable walls as exposure to the elements accelerate the problem. 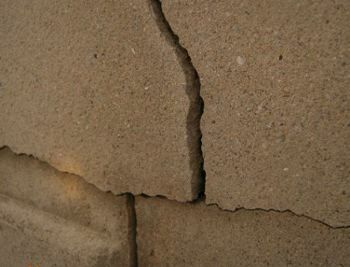 As the problem progresses, cracks get wider and lateral displacement can be seen as the blocks underneath the plaster disintegrate. Rather than a simple diagnosis of pyrite – defective building blocks seem to be at fault. These blocks appear to have been used in the construction of homes and buildings throughout the country. As yet, the exact problem within the blocks has not been established and testing is underway. It could be pyrite, but Damien says a number of factors could be at play – such as a low cement content in the blocks, fine stone or Muscovite Mica. The potential scale of the problem is only just emerging, and Damien says many homeowners may not yet even be aware that their homes are at risk. The cost of repairs could run into the thousands, and with so many homeowners already struggling with their mortgages, the question remains how will the situation be resolved? On Thursday we heard from another affected homeowner in Donegal, Garvan. Garvan home is ten years old, but realised the extent of the problem about 6 years ago. At that time he tried to plaster over cracks in the external walls of his home, only to find the blocks underneath crumbling away in his hands. You can listen to what he had to say here.